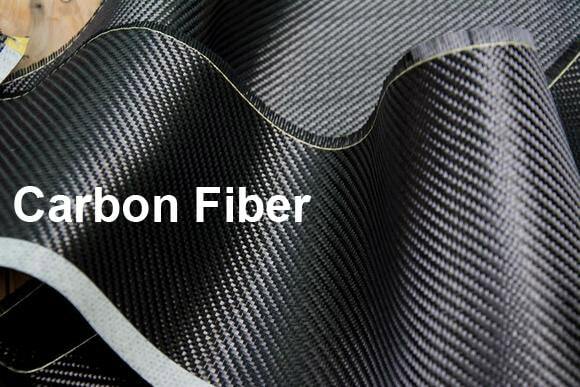 Carbon fiber is a high-tensile fiber or whisker made by heating rayon or polyacrylonitrile fibers or petroleum residues to appropriate temperatures. Fibers may be 7 to 8 microns in diameter and are more that 90% carbonized. This fibers are the stiffest and strongest reinforcing fibers for polymer composites, the most used after glass fibers. Made of pure carbon in form of graphite, they have low density and a negative coefficient of longitudinal thermal expansion. Carbon fibers are very expensive and can give galvanic corrosion in contact with metals. They are generally used together with epoxy, where high strength and stiffness are required, i.e. race cars, automotive and space applications, sport equipment. Depending on the orientation of the fiber, the carbon fiber composite can be stronger in a certain direction or equally strong in all directions. A small piece can withstand an impact of many tons and still deform minimally. The complex interwoven nature of the fiber makes it very difficult to break. Physical strength, specific toughness, light weight. Good vibration damping, strength, and toughness. High dimensional stability, low coefficient of thermal expansion, and low abrasion. Biological inertness and x-ray permeability. Fatigue resistance, self-lubrication, high damping. Chemical inertness, high corrosion resistance. High-heat-treatment carbon fibers (HTT), where final heat treatment temperature should be above 2000°C and can be associated with high-modulus type fiber. Intermediate-heat-treatment carbon fibers (IHT), where final heat treatment temperature should be around or above 1500°C and can be associated with high-strength type fiber. Low-heat-treatment carbon fibers, where final heat treatment temperatures not greater than 1000°C. These are low modulus and low strength materials. The two main applications of carbon fibers are in specialized technology, which includes aerospace and nuclear engineering, and in general engineering and transportation, which includes engineering components such as bearings, gears, cams, fan blades and automobile bodies. Recently, some new applications of carbon fibers have been found. Such as rehabilitation of a bridge in building and construction industry. Others include: decoration in automotive, marine, general aviation interiors, general entertainment and musical instruments and after-market transportation products. Conductivity in electronics technology provides additional new application. Aerospace, road and marine transport, sporting goods. Missiles, aircraft brakes, aerospace antenna and support structure, large telescopes, optical benches, wave guides for stable high-frequency (GHz) precision measurement frames. Audio equipment, loudspeakers for Hi-fi equipment, pickup arms, robot arms. Automobile hoods, novel tooling, casings and bases for electronic equipments, EMI and RF shielding, brushes. Medical applications in prostheses, surgery and x-ray equipment, implants, tendon/ligament repair. Chemical industry; nuclear field; valves, seals, and pump components in process plants. Large generator retaining rings, radiological equipment. Carbon fibre is sometimes used in conjunction with fiberglass because of their similar manufacturing processes, an example of this would be the Corvette ZO6 where the front end is carbon fibre and the rear is fibreglass. Carbon fiber is however, far stronger and lighter than fiberglass. Carbon fibre can be found in a wide range of performance vehicles including sports cars, superbikes, pedal bikes (where they are used to make frames), powerboats and it is often used in the tuning and customising industry where attractive woven panels are left unpainted to 'show off' the material.